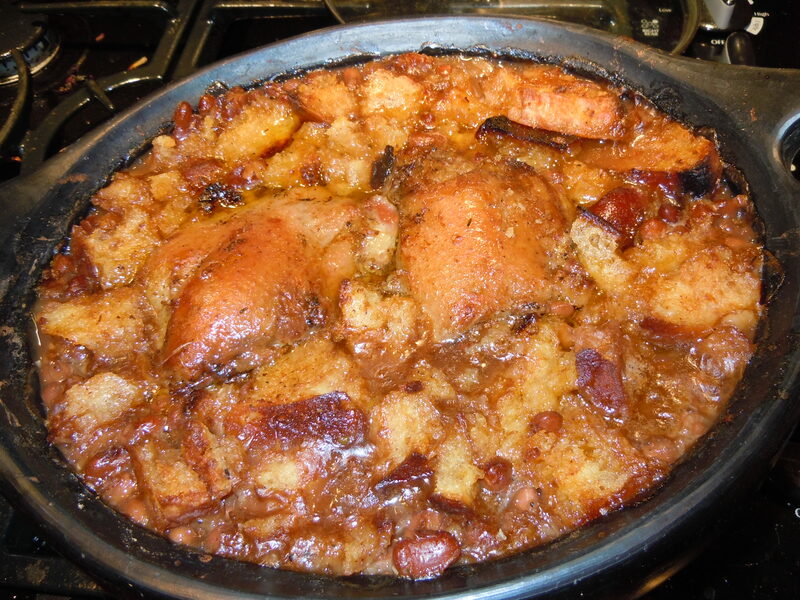 There is an odd mystique about cassoulet. There are online butchers who will sell you the ingredients to make authentic cassoulet for eight people for 85 dollars. To me, this is bemusing. It’s a peasant dish, and like most such, its original intent was to nourish people well with minimal labor and cost. The magic combination is a lot of legumes with a small amount of very flavorful meat, plus seasonings. Nearly every society has some equivalent, from split pea soup to the red beans and rice that was eaten by the quart in Louisiana when I was growing up. So at first I thought of calling this post “Bean Pot,” but then I decided that it was time to demystify cassoulet and make it clear that this is a great dish for times when weather is cold, dollars may be short, and a meal that feeds abundantly and warms from the inside is called for. Let’s make this dish our own and adapt it to our needs. For a great big dishful, you will need a pound of dried beans, two large onions or three small ones, 4-5 cloves of garlic, some olive oil, 2 cups of good rich stock or broth, a large carrot, a small bunch of thyme, a cup or two of homemade bread crumbs or small chunks of bread if you want to gratinee the top, and about a pound and a half of very flavorful meat. A combination of types is preferable. Some possibilities are duck confit, good sausage, ham, fatty cuts of pork already cooked for some other purpose, smoked hocks (no more than one,) or whatever your taste dictates. If you have any marrow from a ham bone, it’s a great addition. If I have a couple of pork ribs left over from experiments with my smoker, I’m apt to include them. I would not use anything with strong distinctive seasoning that will stand apart and not amalgamate itself; chorizo is a good example, as much as I love it. Don’t use anything very lean; there is little meat in comparison to the amount of beans, and it needs to lend some unction to the beans. Small raw sausages can be cooked whole in the beans, but anything large and raw should be cut in chunks or precooked, such as panfrying a thick raw sausage until nearly done before including it. If you do this, remember to save the fat to add to the beans. If you insist on using a ham hock, it will add a wonderful flavor and texture but does need to be slowly simmered for a couple of hours in the stock before use, which is a drag. Ham shanks are easier in that they are more tender and can be put directly in the dish. First, catch your beans. 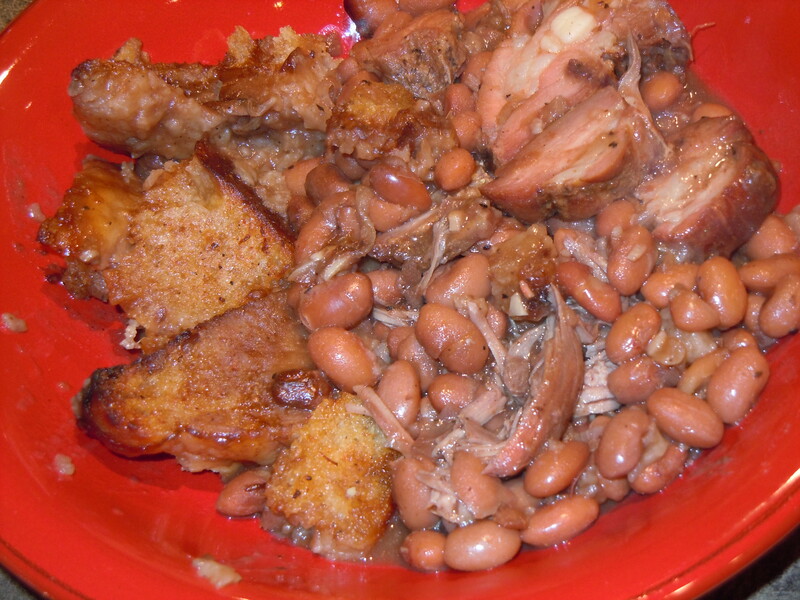 I used a local New Mexico product, bollita beans, but I would happily use pinto beans, cannelini beans, or any other bean that cooks up soft and plump without falling apart. I started with a pound of beans and cooked them in my solar cooker the day before I wanted to make the dish. You can cook them any way you like. There’s a lot of mystique about cooking beans, too. Here at 5000 feet above sea level with very hard water, I do presoak and then cook in filtered water, and I don’t salt them until they are almost done, and then I salt generously. In Louisiana, with very soft water and an altitude just a smidgeon above sea level, beans cooked to perfection in a few hours with no special considerations. Know your conditions, and cook accordingly. If you aren’t cooking them a day ahead, they need to be ready at least 90 minutes before you want to eat. Make sure they are salted to your taste! Preheat your oven to 350 degrees. While the beans soften to perfection, or reheat if cooked the day before, chop the onions and garlic finely. I do all the cooking in the big La Chamba clay casserole in which I will finish the dish, largely because it’s a thing of beauty and I love to handle it. You can use a skillet if your casserole won’t take direct heat. Heat the olive oil over medium heat, saute the onions until they are becoming transparent, add the garlic, and saute until thoroughly cooked and maybe coloring a little (I like the richness of flavor this adds, but don’t burn them.) Drain the beans, saving the broth for something else, and mix with the onions and garlic. Add the chopped thyme and 1.5 to 2 teaspoons of freshly ground black pepper (very important to the final flavor.) Taste the beans and make sure they are salted to the level that you want. Now stick the meat into the beans. If you are using raw sausage or any raw pork, keep it near the top. I used some sections of smoked spareribs and stuck them well down into the pot. I always plop a leg of duck confit on the top. If you’re using duck make sure the skin is a little above the beans to that it can get nice and crisp. Pour a cup and a half of rich hot stock over all, and save the rest of the stock in case you need it later. Stick the dish into the preheated oven for an hour, then carefully haul it out and poke around a little. Since everything was hot when you started, any sausage or pieces of raw pork should be cooked at this point, but if not, keep them on top where you can fish them out for extra cooking if needed. Make sure there is some fluid near the bottom, and add more stock if the beans seem too dry. If you want a gratineed top, as I always do, cover the top with breadcrumbs or little pieces of bread, making sure not to cover the duck skin if you’re using it. Stir the bready stuff lightly into any fat that has appeared on the surface so that it gets deliciously golden and crisp rather than hard. If there is no surface fat, dot the bread generously with butter or drizzle it with olive oil. Bake another half hour. Take it out again, and check the sausage to make sure it got cooked. If the top hasn’t gotten crisp and gold, run it under the broiler until it is, but make sure not to burn it. Serve, making sure that everyone gets some of the crisp bready bits on top, and a fragment of the duck skin if they want it. 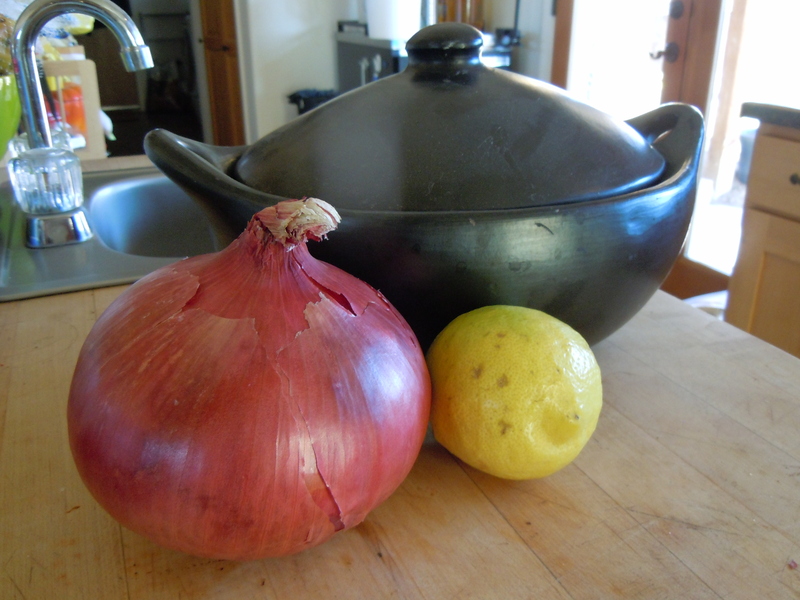 The taste of the dish is simple and pure, and can waken ancestral memories of the farmhouse table. A green salad on the side is nice, but fussy vegetables are just not needed. This makes a lot of hearty food. My clay casserole is about 11 inches long, nine inches wide, and four inches deep, and this fills it to the brim. Leftovers are likely, and welcome. Love this post. I just made French cassoulet for the first time, and my first thought was “this concept can be extended to any flavor profile and cuisine”. I look forward to trying the southwest version this winter. I also love that you cooked your beans in your solar cooker! Yes, there probably is not such a thing as a culture anywhere in the world where thrifty people have not developed some version of beans flavored and seasoned with a little bit of meat. And solar cookers are perfect for cooking beans and chickpeas. Take off the “fins,” at least on my model, and you have the perfect box for slow simmering. Since I went low-carb several years ago I don’t eat beans or chickpeas that often, so I don’t have as much use for the solar cooker as I used to, since when I make stock or bone broth it is in really large quantities that my solar cooker couldn’t handle. But for anybody who wants to make smaller amounts of stew or broth, beans, chickpeas, whole-grains, any of those long cook things, solar cooker is pretty much made to order.